So often I end up putting together some RESTful services (or the intent is to at least build them with that premise, but we all know how that ends up). The API URIs routing gets put together and one wants to take a crack at the service as soon as possible. Here’s a quick guide for using cURL to take some basic actions against the services and understand what you’re getting back. Don’t get intimidated! It goes on and on and on, but just know it’s installed if you see all these goodies. If you don’t get the results above, then installing cURL is the next step. I’ll leave that to you. Here’s some links to download and get started however. Next you’ll of course need Node.js and Restify installed. I’ll assume you have Node.js installed. Create a directory and in that directory just run the following command. Ok, now to run this with node.js just issue the command to launch node.js with this file that was just created. Now the service is running on port 8080 against 0.0.0.0. To check out what a standard GET verb will do in a browser, open up a browser and navigate to http://0.0.0.0:8080. Browsing the GET response via Chrome. You’ll see this in the browser window. Just straight plain text too. If you look at source, this is all you get back. Now open up a terminal and run the following cURL command to execute a GET against the URI & port. This is the most basic cURL command one can make. It is simply issuing a GET request against the URI and will display the body of the response. The response will be similar to this for the particular request. To get a little more information you can get the header of the response dumped into the terminal with a -i. The -i option stands for –include, to include the header. Issue the command as either line shown below. The response will be provide a little bit more about what is going on. With this response the actual response error code number is shown. In this case we have a 404, which points us to the problem with this curl request. The server isn’t returning anything to our curl request. If we look at the code, we can see that the ‘get’ route is setup as ‘/hello/:name’ which means that the domain root is only looking at http://url_root/hello/someName for a request to be made in order to return a response. Issue a command against the server now with the following curl request. The response should come back as an actual response with content. Here the content is returned as “hello Adron” and the header returns a 200. The content type is application/json format with the length returned as 13. Note also the connection is set to keep-alive. Let’s dive into that. If we change the connection type, which is important for many scenarios, we have to send extra header information to ask for the response to be returned accordingly. In order to do that we can pass the -H or –header option in with the curl request. If the command is issued with an -i and -H as shown below the result will be as follows. If we take away the -i we’ll just get the response, which is “hello Adron” and wouldn’t get the header, which now returns Connection: close in the response. By default, curl sets the connection as keep-alive, but in order to make the request return right away the connection needs to be issued a request for it to close. By setting the -H or –header value of connection to close, we get the response immediately. With restify, it is also important to note that it checks if the user agent is curl. If it is curl the connection header to close and removes the content-length header. However I’ve experienced that restify is not doing this in all circumstances or that the use of curl is being changed in some of my usage. So don’t always assume that this will be the case. The safest bet is to set the connection closed when done. Thus, adding -H or –header and setting connection to close with a “Connection: close”. Ok, so that’s a pretty solid use of GET with cURL. Let’s dive into some puts and deletes with a get or two thrown in for comparison. Change the executing code to the code shown in the server.js file below. The first section of code to check out is around the function send. This function is setup to take req, res, and then handle next. The req is the request, the res is the response and the next is for issuing to return and continue with the result. The next bit of code starts the server with the restify.createServer();. Just below that there are several handlers that are setup. Webstorm and cURL. Click the image for a full size image. Before continuing on I wanted to cover a few tidbits of the Jetbrains Webstorm IDE. I often switch back and forth between the Sublime/Terminal combo and the Webstorm IDE. The really cool thing about this IDE is that it actually has a Terminal built in, color coding and autocomplete of the code, refactoring, and file and folder viewer and a whole slew of other features. In the image above that I’ve included there are four neon pointers that are displaying some of the key functionality that I’m using to work through this blog entry with cURL and Restify. After I toyed around with Webstorm and bit to get it work in a way that was efficient for me to use it for developing these APIs I stumbled into an idea. I’d provide a page for the APIs that could be located at the root of the API service such as http://api.blagh.com. The APIs would still be a restful type schema like http://api.blagh.com/thing/create or http://api.blagh.com/thing/destroy but at the very root would be a kind of docs. Maybe this could just be a status page even. Whatever the case, there needs to be something at http://api.blagh.com so I decided right then and there I’d switch to express.js to build the rest of the API services. Restify is fine and all but for this, it seemed like express would have all of the pieces I need for this. Just to boot, I then read a few articles about express being faster such as this one. But then I read this issue on github and almost thought, “maybe I should keep using restify” but then I thought, “dammit, just get it done the way you want it built” so it was back to express. It’s easy enough to change this later so I just got back to coding, albeit with express now. So keep reading and in the next day or two I’ll have part two of this series on using cURL to hack at your APIs. Enjoy the composite coding & cheers! Some of you might be thinking “Why not use RIA Services?!?!?! Are you mad! !” Well, there is a big problem, RIA Services doesn’t work against SQL 2000 or SQL 2005, which is the database technology that this particular requirement dictated. Well, now that you have context, I’ll dig straight in to what I did building this prototype out. I need some data, and a database, with just some of the standard junk you’d expect in a production database. 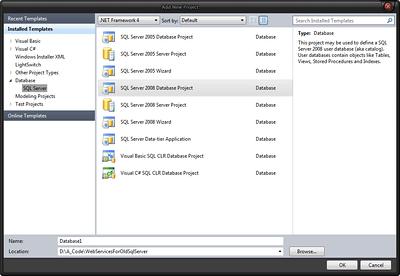 One of the best ways to throw together a database in a really short amount of time, with data, is to use a SQL Server Database Project. First I ran the following script to create the database and some sample tables with various data types. 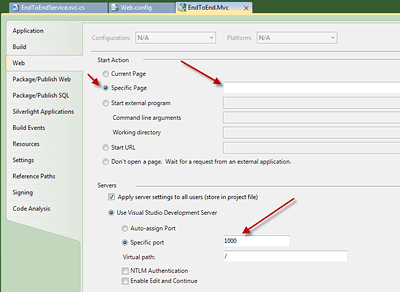 Once the database and tables are created, import the database into the database project. 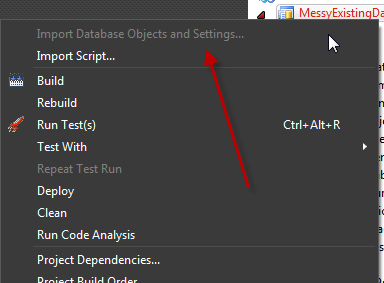 To do this select the “Import Database Objects and Settings…” by right clicking the context menu on the Database Project. Select the database just created and click on start. Once the script generation is done, navigate into the project directories and you will see the following scripts have been created. 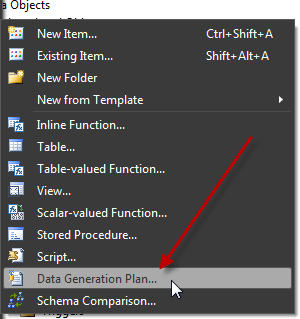 Next create a new data generation plan in the Data Generation Plans folder (notice I already cheated and have one in the above image). Open up the file this creates (I called mine BuildSomeData.dgen). In the file, note I selected the relationship between the Village and People Tables, and set the ratio to 60:1. When you change the data in the Village table it then automatically updates how much data will be generated for the People Table. 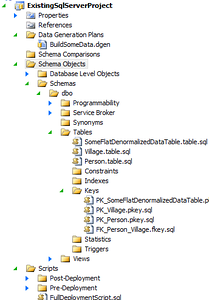 When all that is done, hit F5, select the database and the data will be generated. That gets us a database with data to use as an existing source. From here I’ll jump into creating the actual Facade Layer. NOTES: Once you generate data, depending on how much you decided to generate, you may want to see how big your database is by using the sp_dbhelp stored procedure. I am however, unsure which versions of SQL Server this stored procedure is available in. This entry was posted in .NET Bits, Architecture, How-to, Infrastructure and tagged asp.net mvc, c#, facade, facade pattern, mvc, rest, sp_dbhelp, sql, sql server, sql server 2000, sql server 2005, sql server 2008, web services on July 21, 2011 by Adron. I’ve had the pleasure of working with WCF on three specific projects that have brought me to this blog entry. I haven’t used WCF on only three projects, there are just three that have brought me to write this entry. I’ve used WCF a lot, since back when it was a beta. WCF is great when creating SOAP services and you aren’t too worried about the extra overhead. WCF is great for what it does, for the ideas behind what it does. But writing RESTful web services doesn’t seem to be its strong point. On two huge projects WCF has basically been dropped, or so scaled back one really can’t honestly say that WCF is used, and either an alternate framework has been used or a LOT of custom code ends up being written. 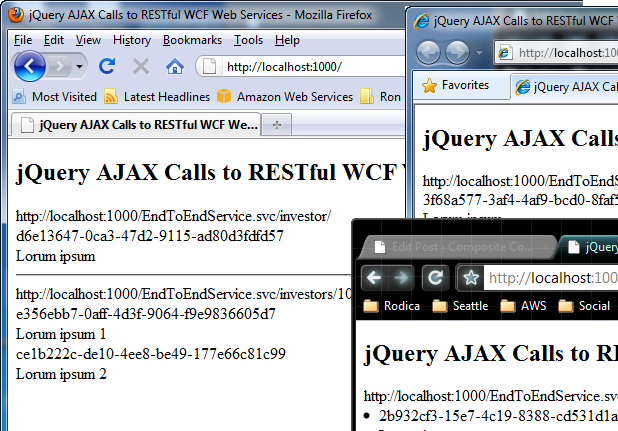 The first time I used WCF to implement RESTful service was at Webtrends. Albeit, there is a single service that returns all types of awesome reporting goodness, however to implement basic auth, logging, polling, and a whole host of other Enterprise Scale needs we had to custom roll most of it. Keep in mind, when doing this the WCF REST capabilities were brand shiny and new, so there were a few issues to work out. Now, maybe WCF could be used and a lot of it would be built in. However as it was, we easily spent 60% of the time writing custom bits because WCF just didn’t have the right options with the right bindings. 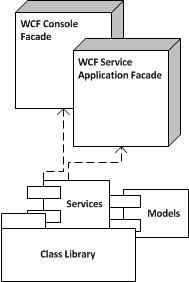 But I digress, I recently implemented an architecture using RESTful services using WCF. But now I’ve come to find myself dropping WCF because of the back and forth and going with ASP.NET MVC controller actions to return JSON instead. With that, here’s to the lean mean controller actions rockin’ the JSON. Here’s what I’ve done to port everything from WCF to MVC. 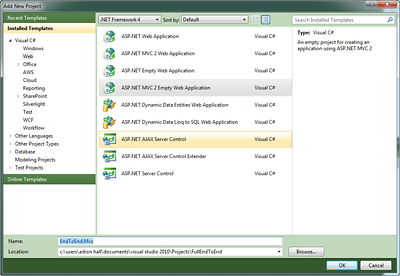 To see what I had done, except on a smaller scale, check out my previous blog entry on ASP.NET MVC with a WCF project smack in the middle of it. This will give you an idea of what I was using the WCF services for, merely to provide JSON results via RESTful services to an ASP.NET MVC front end requesting data with jQuery. This is how I’ve setup the controller to return JSON results via an action. First start a new ASP.NET MVC Project and add a new controller. Cleanup the controller so that you have the following in the controller. Now create a testing project to create your test first. 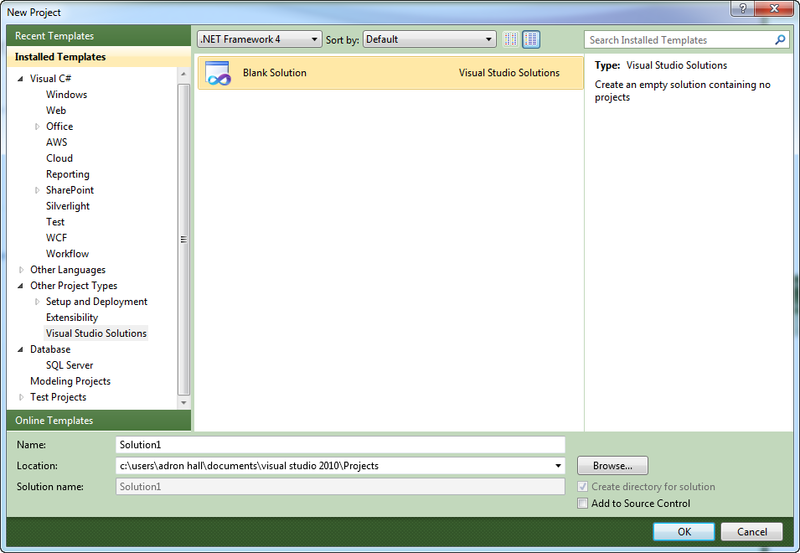 Remember to add the reference to the ASP.NET MVC project. From here we can create the first test. Now fill out the basic skeleton of the action in the controller. Now we should have a good red running on our test. Let’s create a business model class to return as our result next. Now let’s return that object with some fake data. First add [AcceptVerbs(HttpVerbs.Post)] to the action in the controller. Then return a serializable object to the actual method as shown. This is a quick starter. There are a few dozen other options around this capability including other verb usage. For many, this is all you need for your services, especially if their primary purpose is to communicate with a specific website and one doesn’t want the overhead of WCF. 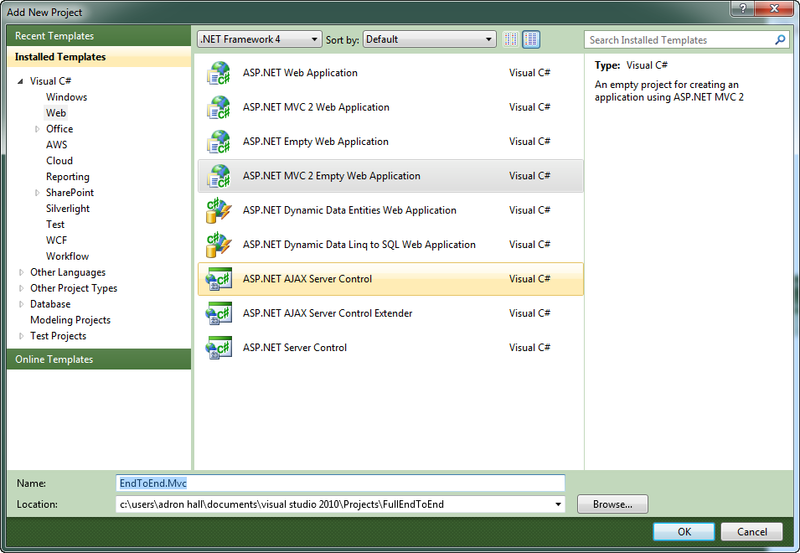 This entry was posted in How-to and tagged asp.net mvc, controller, controller action, http, rest, restful, web services on October 13, 2010 by Adron. I’ve been working through a project recently that I ended up creating an interesting abstraction of an assembly/classes between multiple web services projects. I wrote about it initially in Aggregated Web Services Pt I. In this blog entry is going to cover a few things, based on a full end-to-end implementation of a project from the WCF RESTful Web Services, to the ASP.NET MVC Site, and finally the jQuery calling those same services. First create a new solution. I always like to start with a new solution because it keeps the naming structured right, just from the practice. Once you create all of that then add an ASP.NET MVC 2 Project. Next I wiped out some files I don’t use, and suggest you zap em’ too. Now that we’ve cleaned up those nasty bits, we’ll add our basic model we’ll be using. Now add a interface for the RESTful services to the root of the MVC Project as shown below. Now add the following abstract base class at the root level also. Text = "Lorum ipsum 1"
Text = "Lorum ipsum 2"
Now add a WCF Service file and remove the interface file. Then change the WCF class itself as shown below. The reasons for the abstract class, inheriting from the interface, is that it removes any manipulation being needed with the actual *.svc file. It just seems, at least to me, a little bit cleaner this way. For the last touches for the WCF RESTful Service we need to setup the Web.Config file. I’ve added the section toward the bottom of the config file in the <System.ServiceModel> section. I’ve included the full config file below, so you can easily just copy and paste it if you’re working through step by step with me. One of the things I always do at this point is to setup the project properties. I do this for a number of reasons, primarily to assure that the port number doesn’t go and change itself on me. The other thing I set is the default startup page. 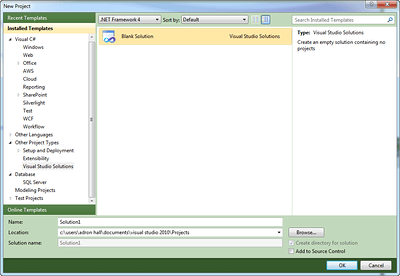 With ASP.NET MVC things get out of sync with Visual Studio, and Visual Studio tries to startup actual *.aspx files. So what I do is just set the startup to an empty root startup. These settings are shown below. First add a home directory, a HomeController.cs, and then add a Core.Master master page to the project. Next setup the Core.Master file with the following content sections. 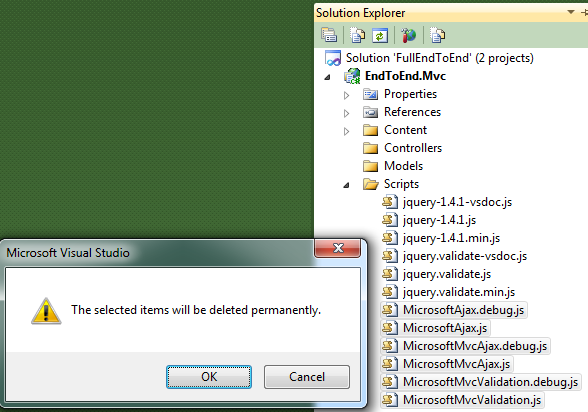 One of the things I’ll point out is that with Visual Studio 2010 you get Intellisense with jQuery. The reason I don’t use the x.x.min.js version of the jQuery is that it doesn’t have the appropriate setup to provide the Intellisense. So be sure for development to use the fully expanded version and you can go to the zipped min version when you go live in production. Another thing I do, which may vary on how you want to develop, is use the hosted jQuery on Google or Microsoft. I did a write up previously for using the hosted jQuery so check it out for reference locations. In the controller add the following code. 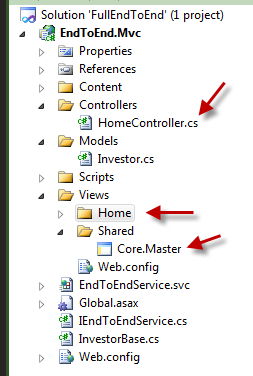 Now that we have the Site.Master and the home controller, create an Index.aspx View in the Home folder of the project. 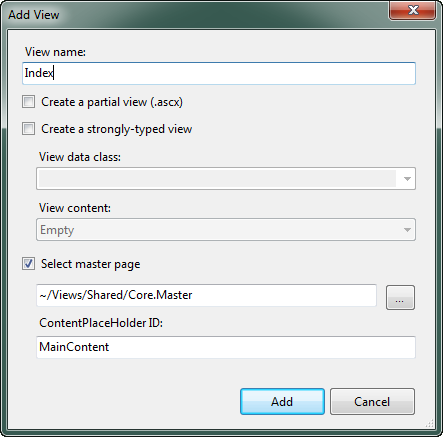 In the view add the following code for the jQuery calls to the services layer. Run it and you should get the following displayed on screen. Let me know if you run into any issues trying this out. Thanks! This entry was posted in Architecture, How-to, Software Projects and tagged ajax, asp.net mvc, asynchronous, jquery, json, rest on September 3, 2010 by Adron.